Take a pan and dry fry Channa dal, dhaniya, red chilies, jeera, Peanut separately without oil and Make powder. Pressure cook rice with 4 cups of water and Let it cool for a while. Cut capsicum and garlic into length wise. Prepare seasoning using seasoning ingredients when mustard seeds starts spluttering add Capsicum, Garlic and keep frying until capsicum gets soft, add ground powder and fry for a minute now turn off the flame. Add cooked Rice and salt to the Capsicum fry and mix well. 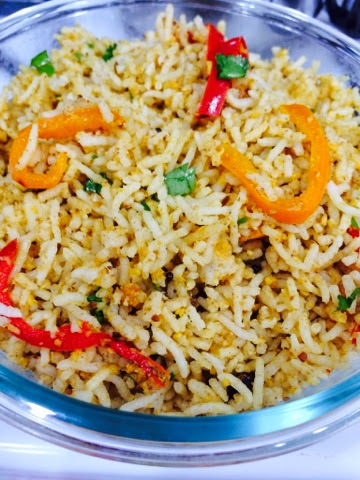 Transfer the rice to a serving dish and garnish with chopped coriander. Prepare seasoning, when mustard seeds starts spluttering add Chopped Drumstick/ Nuggekai, Chopped Potato and fry for 2 to 3 min then add one cup water, tamarind paste, turmaric, sambar powder and jagary, cook until Drumstick/ Nuggekai and Potato gets soft then add Peanut Powder, Coconut Powder and cook for 2 to 3 minutes. Microwave frozen Blackeye Beans for 4 to 5 min, if its not soft then you can microwave it for few more minutes, let the Beans gets cool to room temperature. Add Chopped Onion, Finely Chopped Cucumber, Grated carrot, Chopped Tomatoes, Chat Masala, Chili powder, salt and Squeeze lemon to Blackeye Beans, mix these ingredients and transfer to a serving dish and garnish with Chopped coriander. Prepare seasoning add Ginger and green chilies, when they get soft add Tomato and salt fry until it become tender and all the excess water evaporates. let it cool for a while. Beat yogurt until smooth then add Tomato.